Photo found on Flickr.com courtesy of Tammy Leino. 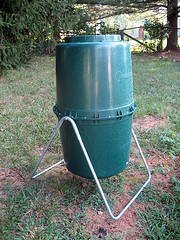 Spinning a tumbling compost bin daily can often produce compost in as quickly as 21 days. These bins are also typically above ground, so they are resistant to attacks by pests and animals. Photo found on Flickr.com courtesy of Clean Air Gardening. 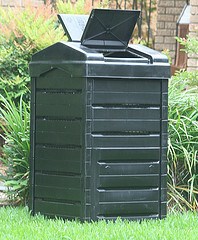 Stationary Compost Bins will typically sit in one area of the yard and can vary in size. However, they are excellent if you need to yield a large amount of compost, and are generally properly aerated. It can at times, take longer for materials to break down. Image found on Flickr.com courtesy of Colonel Mustard. A worm compost bin is just what it sounds like – it makes use of worms to aid in the breakdown of organic material into compost. Waste is typically broken down quickly with these bins, and is great for producing compost tea – a liquid substance that occurs naturally when producing compost that is high in nutrients and really good for your garden. 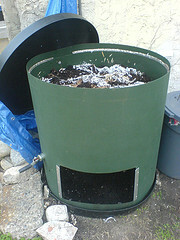 A multi – bin system is choice if you have a lot of composting to do, or desire do to composting continually over time. You can have different stages of compost in each bin, and in the end come out with a lot of compost for your lawn or garden. How much compost do I need to create? This all depends on your composting needs. For example, if you are going to be working constantly with a large surface area and are going to require large amounts of compost for your garden, then something such as a multi-bin system may be perfect for you. What material will I be composting? Obviously, there are certain things you shouldn’t compost (animal fat, for instance). However, if you are composting a lot of vegetables with some leaves and grass, then it may make sense to purchase a tumbling compost bin or a stationary compost bin – something with easy access from the kitchen in the backyard that can get regular use. What is the space/surface area I am working with? This is also an important question to ask, because it can basically determine the size of your bin. If you are working with a smaller surface area, then a large compost bin is not going to make sense. It is vital that no matter what the compost bin or style you feel is right for you, it is properly aerated and has a hole large enough for you to get your compost out of. In addition, your bin should be something that is convenient for you – something that you can get to and from easily, and that will be practical for all of your gardening needs. If possible, try and obtain a compost bin that will be above ground and resistant to rodents, so your compost can decompose quickly and efficiently.